This unique wall mounted bathroom wash basin tap is operated via separate hot and cold controls. The very latest in Italian bathroom design this modular tap has a built in soap dish and tooth brush holder as well as having space for handy towel hanging. 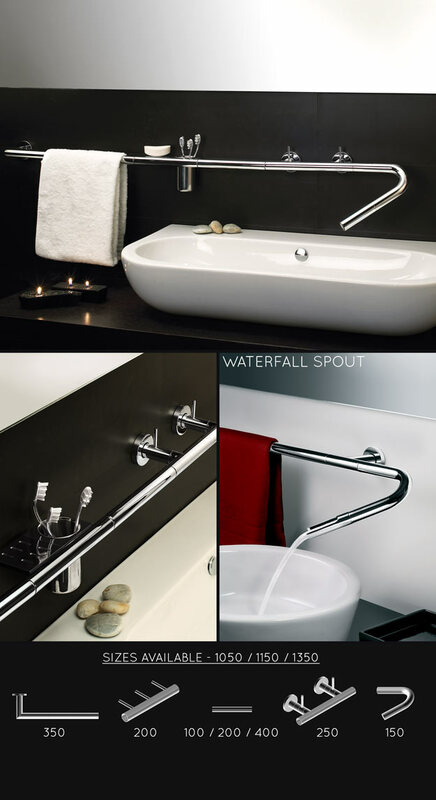 We also offer the options between a waterfall spout end and a aerated water spout end, plus the choice of 3 tap length to suit all bathrooms. * Unique Italian tap design. * Soap dish & tooth brush holder. * Choice of tap lengths. * Choice of spout ends. * Quality chrome on solid brass..